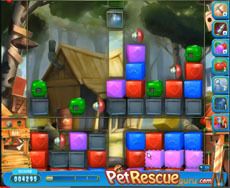 The secret in pet rescue 286 is to use the half line blasters in the right direction and at the right moment in order to get helped to rescue the pets. Destroy with them the metal boxes that are under the pets bringing them in one line. We kept two line blasters for the final phase of the level and it was really necessary to complete the level. Don’t bother if you will not release all the pets from their cages. When you’ll clear almost all the blocks of the level they ‘ll come side by side and then you can do it. Don’t get disappointed if stuck on pet rescue level 286. The following video will help you to beat this level, without using any boosters.